2017 has been a blind rollercoaster ride of a year, the ups and downs have come in the most unpredictable places. 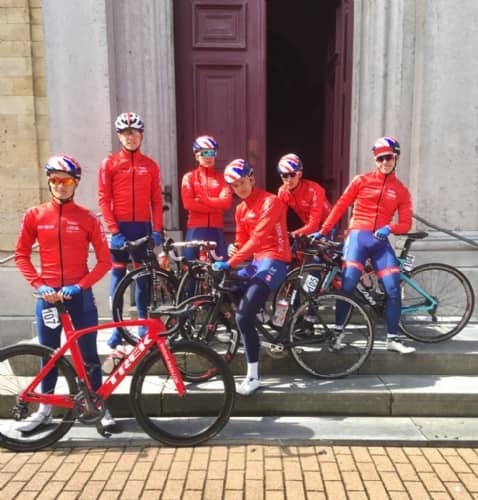 It started off relatively well in Apeldoorn as part of the GB junior track team, where we won the Team Pursuit and I went on to win the points race the next day. I showed decent form and was satisfied with how it all went. A couple of weeks later I raised my game drastically and found myself in the stripes of the Senior National Points Race Champion – a surprise to everyone. Just as quickly as I gained that form and motivation, it fell away after a nasty illness which made me lose over 5kg in about a day and a half and put me off the bike for too long. From that day onwards I struggled to find anything in me to perform and by the time I got to Belgium for a month away from home racing and training, I was not in the condition I had hoped for. My first race was a track meet in Gent, where I struggled to beat an average junior field, but got some surprisingly strong results in the U23 Scratch (those that know me will be just as confused as I was) and the Elite Madison with Evan Oliphant against the likes of Kenny de Ketele and Moreno de Pauw. So I took a bit of confidence from this, but fast forward a couple of weeks and I’m on the floor, my knees are wrecked, bike is well and truly broken and my motivation has fallen through the floor after some dodgy riding on other peoples behalf. Had I been to blame then I’d have been upset but not angry, but a crash in which pretty much the only thing that doesn’t snap in half is your bottle cage where you weren’t to blame… It’s not easy to take. So I went into the rest of the races a bit down, which is why it was great to come out of Roubaix and Ster van Limburg with a win for the team and a jersey for me in the latter. Despite finally finding a result on the road towards the end of my stay in Belgium, I feel like I’ve got a lot more more to give and I’m looking forward to the next UCI Nations Cup event in Karlsberg next month. As always, I’d be nowhere without the help I receive on a daily basis from everyone at Hardie’s Bikes for their unwavering support and from Trek and Bontrager for their understanding when I send them another broken piece of kit. On top of this, without the Braveheart Fund I wouldn’t be out doing all these, so a huge thanks to them also.